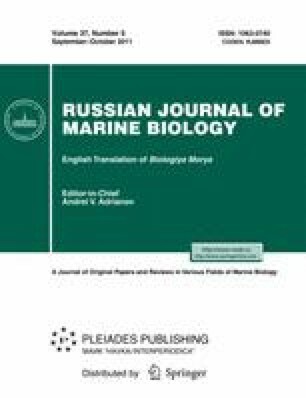 The results of year-round studies of the photosynthesis and respiration rates of the eel grass Zostera marina L. in the White Sea are presented. The annual production of eel grass is estimated to be 9.86 × 1011 kcal. It is concluded that the total annual production of the eel grass constitutes about 3% of the annual phytoplankton production (3 × 1013 kcal; according to the data of Bobrov et al., 1995) in the White Sea. Original Russian Text © V.Ya. Berger, 2011, published in Biologiya Morya.